This recipe makes a wonderful accompaniment to roasted meats. The delicate anise flavor of the fennel pairs well with the roasted garlic and orange dressing. Garnish this with orange slices for more citrus flavor. Remove the stems from the fennel bulb and slice each bulb in half. Making a triangular cut, remove the rooty heart from the base of each half and discard. Slice each fennel half into 1/4-inch strips. In a roasting pan, toss the julienned fennel, peeled garlic cloves, and salt together. Pour the olive oil over it and cover tightly with foil. Bake in a preheated oven at 325ö for one and a half hours or until both fennel and garlic are soft. Using a slotted spoon, remove the fennel and garlic from the olive oil. Try to drain as much of the oil from the fennel as possible. Save the oil for the dressing and for use as a flavored oil in other dishes. 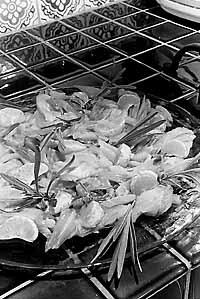 In a blender add the orange juice, mustard, honey, vinegar, and four of the cooked garlic cloves from the fennel confit. Blend the ingredients, and while the machine is still on, gently pour the olive oil into the blender through the feeder opening in the lid. The resulting mixture should be completely smooth and will not separate. Add salt to taste. Drizzle the fennel lightly with the dressing. This can be served warm or at room temperature.